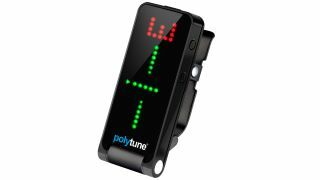 Never one to pass up the opportunity to refinish a tuner, TC Electronic has unveiled a black version of its PolyTune Clip polyphonic clip-on guitar tuner. Touting the new design as the "black belt of all things tuning", the PolyTune Clip Black boasts a discreet design for stealthier tune-ups. Otherwise, it's business as usual, with polyphonic/monophonic adaptive tuning, a 0.02-cent accurate strobe tuner, super-bright flippable screen and padded clip. The video above has left us with two non-PolyTune-related questions, though: 1. Is that a shimmer reverb? 2. Is TC making a shimmer reverb? The PolyTune Clip Black is available in November for $49.99/€49.99. As for that shimmer reverb, we'll wait and see. If you're keen to get in on the PolyTune action, you can snag yourself a free Clip (in the original stainless steel finish) by subscribing to Total Guitar - get all the info here.